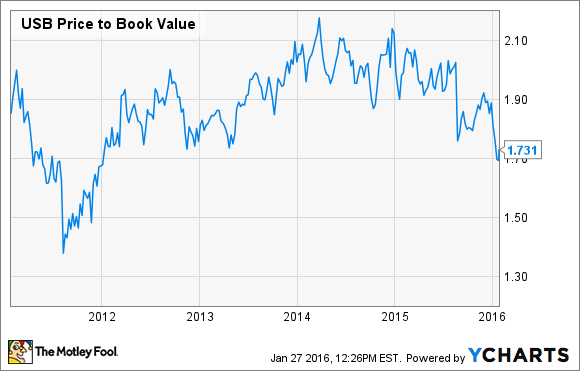 Will 2016 Be U.S. Bancorp's Best Year Yet? 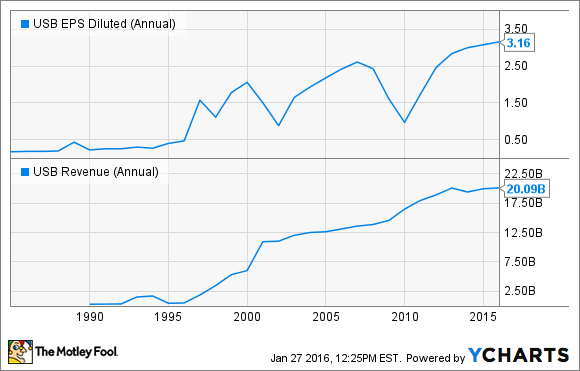 Can U.S. Bancorp continue its momentum this year? As far as revenue and earnings per share go, 2015 was U.S. Bancorp's (NYSE:USB) best year ever. Impressively, this was accomplished in the midst of a challenging global economy and a low-interest environment that has cause bank profit margins to contract to historically low levels. As we head into 2016, is there reason to believe U.S. Bancorp can do even better? As I mentioned already, 2015 was a strong year for U.S. Bancorp. Not only were revenue and earnings the highest they've ever been, but there was impressive growth in many of the bank's businesses. For example, the bank reported 4.2% year-over-year loan growth in the fourth quarter, including impressive 9% growth in commercial lending and 13% in auto lending. Credit card and debit card revenue grew by 8.1% from a year ago, and there is reason to believe this could continue into 2016, as we'll see shortly. On the deposit side of things, U.S. Bancorp reported year-over-year deposit growth of 6.9%, including 11.4% growth in low-cost deposits (such as savings accounts). The bank's assets continued to improve as well. U.S. Bancorp is known for its high-quality loan portfolio, and it's gotten even better -- the bank's overall loan delinquency rate fell by 20% from 0.97% to 0.78% during 2015. The combination of solid assets, good expense management, and strong revenue growth allowed the bank to produce an industry-best return on assets (ROA) of 1.44% for the full year, and a 14% return on equity (ROE). The bank returned 72% of its earnings to shareholders in the form of dividends and buybacks and was able to increase its dividend by 4.7%. To sum it up, U.S. Bancorp had a great year in 2015, despite sluggish economic growth and the persistent low interest rate environment. Could 2016 take the bank to the next level? In its press release and post-earnings conference call, U.S. Bancorp's management expressed optimism for 2016. According to U.S. Bancorp's President and CEO Richard Davis, "We are well positioned as we move into 2016 -- as indicated by our record fourth-quarter revenue, strong momentum toward positive operating leverage during the quarter, and the continued stability in our net interest margin." In the conference call, Davis praised the bank's renewed emphasis on efficiency and foresees the bank's efficiency ratio to remain in the "low 50s" going forward. For the fourth quarter of 2015, the efficiency ratio of 53.9% was the best of its peers, and it's one of the primary reasons for the best-in-breed profitability I discussed earlier. As far as growth for 2016, there are a few reasons to be optimistic. In the credit card business, U.S. Bancorp recently became the exclusive issuer of Fidelity's co-branded cards, and purchased the existing $1.6 billion card portfolio. This brings a new national, affluent customer base into the bank and creates tremendous opportunity for all-around growth. In addition, Davis said the new developments in mobile technology, expansion into Europe, and growth in the corporate banking business could all drive revenue growth in 2016 and beyond. The bank also launched its "The Power of Possible" branding campaign, intended to emphasize U.S. Bancorp's consumer-centered approach to the banking business. Whether or not 2016 will turn out to be U.S. Bancorp's best year ever remains to be seen. Nobody can see the future, and there are many things that could happen between now and the end of the year, both good and bad. However, the potential for 2016 to be the best year yet for U.S. Bancorp is definitely there, and the bank is currently trading at its lowest valuation since 2011, thanks to this year's poor market performance. To sum it up, U.S. Bancorp is in a strong position to be able to grow in the years to come, and is on sale right now. It may be a great opportunity to get in.